One of the most visual exhibitions that takes place at our Woodside factory would be the Enrobing Machine and Cooling Tunnel. The Cooling Tunnel is a long structure, that runs the length of the building. This tunnel works in conjunction with our Enrobing Machine. 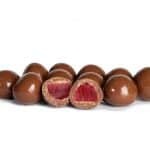 Together they create a range of products, such as Chocolate-coated Marshmallows, Turkish Delight, Aniseed Rings and many more. With the Offload Room providing the perfect vantage point, you can watch as the products leave the Cooling Tunnel and fall into the prepared boxes. 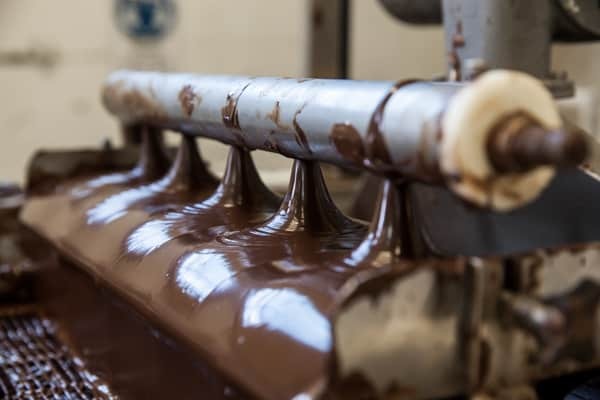 The Enrobing Machine creates a cascade of liquid chocolate, which the products move through before they move down the Cooling Tunnel. 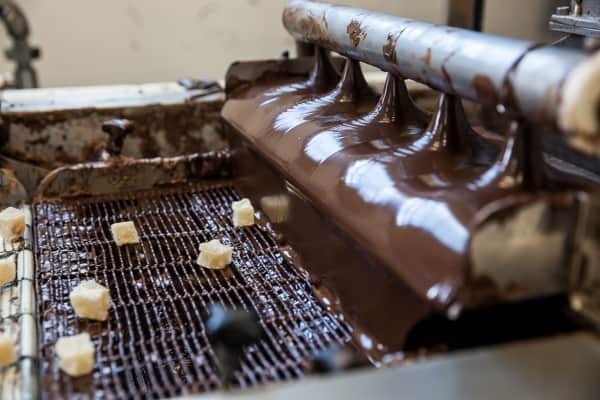 Once coated, the treats pass under an air curtain and over a vibrating plate to remove the excess chocolate. They then continue through the Cooling Tunnel where they slowly set before reaching the Offload Room. 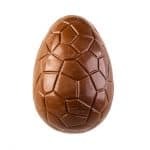 These chocolates are then packaged up and stored in our Chocolate Room, or immediately hand packed depending on demand. Besides smaller products, our Cooling Tunnels plays a key role in producing our Cow Pats. Mixed by hand, these Pats are placed on plastic plates, without the use of the Enrober and moved down the tunnel to set. 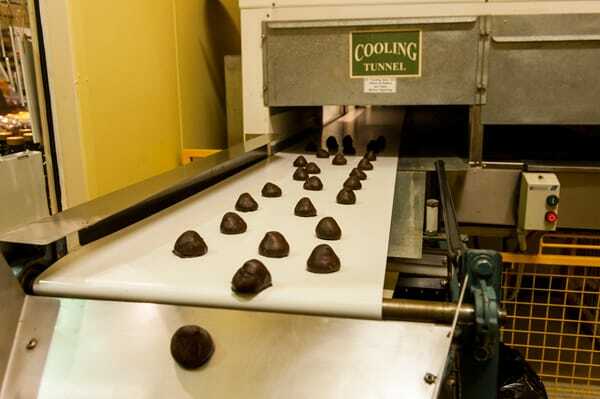 Besides our Cow Pats, the Cooling Tunnel is responsible for setting the chocolate on our treats! Watch the video above and see how we create our delicious Turkish Delight!